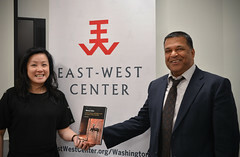 The Asian Studies Development Program’s 24th National Conference Understanding Asia: Past and Present on March 1-3 in Washington, D.C. was a big success! The conference, honoring the memory of esteemed Confucian scholar Dr. Henry Rosemont, Jr., (pictured to the left) began with an afternoon tour of the Freer Galleries followed by an evening reception. Friday’s keynote Jennifer Turner of the Wilson Center spoke on Can Red China Really Be the World’s New Green Leader? 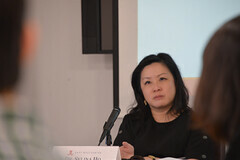 And on Saturday, keynote Daqing Yang of George Washington University spoke on The Weight of History in East Asia. ASDP Conference attendees, those here for the first time as well as faithful regulars, shared scholarship with each other on panels ranging from art, gender, history, identity, literature, and pedagogy, and philosophy. Plenary panels included Getting Henry Right: The Upside of Against Individualism and A Toast to Henry Rosemont, Jr., a revered scholar, and friend. Ashok Malhotra and Roberta Adams, Fay Beauchamp, Marthe Chandler, and Larry Butler are pictured in the images above. Be sure to check out the conference program at the link above! MCC was awarded a multi-year Asian American and Native American Pacific Islander-Serving Institutions (AANAPISI) grant to support Asian and Asian-American student success. In collaboration with ASDP, 10 MCC Faculty Fellows in Year 1-2 and 20 Faculty Ambassadors in Years 2-3 are participating in structured monthly faculty development seminars and multi-day workshops hosted in conjunction with local institutions. Faculties are creating modules on Asian/Cambodian themes that will be embedded into courses across the general education curriculum. Shelley Hawks, Roger Ames, Arn Chorn Pond, and Sreang Heng presented talks on their experiences and knowledge of this theme. EWCA Board News: Karen Nunan has agreed to continue as a member of the East-West Center Association Board for another 3-year term. Dr. Vuylsteke’s visit revitalized their Chapter energies and encouraged members to pursue new projects to contribute to the EWCA. The Brisbane International Chapter wishes to thank Dr. Vuylsteke for making time in his busy schedule to visit Brisbane and meet with them. They hope that the contacts he has made will prove to be fruitful and we would welcome the opportunity to host him again sometime in the future. EWCA Seoul Conference: Our treasurer, Dr. Bhishna Bajracharya, will be representing our Chapter in Seoul. Bhishna and our Secretary, Edilyn Bajracharya, will be presenting a joint paper at the conference. One of our newest members, Dr. Janani Ganapathi, will also be presenting a paper at the conference. Dr. Bhishna Bajracharya will travel to Nepal and Indonesia: Associate Professor Bhishna Bajracharya attended a national urban governance conference in Nepal organised by the Asia Foundation and Asian Development Bank on Feb 27-28. Bhishna was invited to the meeting to speak on ideas for financing urban services in the new federal governance structure of Nepal. In the first week of April, Bhishna will be attending another conference in Bandung, Indonesia where he will be presenting a paper on regional governance for urban and peri-urban areas of South East Queensland in Australia. Support for Nepalese students: We have continued to support two Nepalese women students through their secondary and tertiary studies. Suna Rai has now completed her studies and has secured employment in fashion design and manufacturing company in Kathmandu. Lasha Mandahar is in her final semester of nursing studies in Bangalore, India. She hopes to spend another year in India for internship training before returning to Nepal as a qualified nurse. Australian Red Cross, Queensland: Two Chapter members, Karen Nunan and Iraphne Childs continue as emergency volunteers based in Brisbane, but ready to go anywhere in Queensland if needed for disaster recovery assistance to local communities. The Red Cross deployed Karen Nunan in March to North Queensland for flood recovery work. Support the Center with financial contributions: Chapter members are encouraged to make contributions to the Center individually. Contact information to update list to the Alumni Office: Most Affiliate members live outside of Brisbane in Australia, and so dues are optional. They are asked to let us know when they are in town, so we can try to offer some hospitality, and are kept informed of our activities so they can join in if they wish. The next Chapter meeting will take place in Brisbane in late April. The Bangladesh Chapter could not hold formal chapter meetings during the past quarter because of various preoccupations and as some members were indisposed with illness. However, communication among the chapter members maintained their contacts over the telephone, and Internet communication during the reporting period. The Chapter is still planning to undertake small projects with attention to the poor section of the community namely, supporting poor students with financial assistance in the form of book allowance. The Chapter Leader visited Kolkata, India and tried to contact some EWC alumni while there. However, only one alumni Mr. Narayan Das Sharma could be contacted as only he lives in Kolkata now. The other alumni from Kolkata could not be contacted since they have moved to other places. Chapter leader Abu Ekramul Ahsan visited the United States in February and March 2018. He was in the New York area and had planned travel to the EWC Washington DC office. Unfortunately, very bad weather conditions and a complete shutdown of the Northeast coast air, train, and highway corridors created by a massive snowstorm that produced heavy snowfall for a prolonged period forced him to cancel travel. Now that the Chapter Leader is back to Bangladesh an attempt will be made to reactivate the chapter with meetings and initiating community development projects. The next chapter meeting will be held soon, but the date of the meeting is yet to be decided. The Mumbai Chapter has not met in the last quarter. In spring 2018, Sarosh Bana, leader of the Mumbai chapter, published two significant articles of interest to the EWCA community. “Travelling Together,” which discusses Prime Minister Benjamin Netanyahu’s state visit to India and the growing partnership between Israel and India in the January 2018 edition of Business India: The Magazine of the Corporate World. The second article, published in the same journal in the January-February edition discusses the fiftieth anniversary of the Indian navy’s submarine fleet in an article titled “India’s Submarines at 50.” Congratulations are due to our longstanding member of the EWCA Alumni Community Sarosh Bana. If you would like to receive copies of the articles, please contact Sarosh Bana, the Mumbai Chapter leader. The EWCA-Japan (Kansai) Chapter engaged in the following activities between January 1 and March 31, 2018. The Kansai Chapter decided to hold the second board meeting at Doshisha University on 22 April 2018 through an e-mail conference. the possibility of holding an open seminar for high school students in Kyoto or Osaka or both to promote EWC activities, and to let them know how exciting it is for young people to study abroad. review of the administrative structure of the Kansai Chapter for the following two-year period (2018-2020). continued discussion of what kind of activities EWCA-Japan (Kansai) Chapter should promote in the future. The Kansai Chapter is also planning a social gathering among board members after the second board meeting nearby Doshisha University. For the past two years, Quarterly Report from Korea was mainly about preparing for the 2018 Seoul Conference. Now we have completed the agenda and procedures of the conference and its accompanying problems. The 2018 conference in Seoul is a great occasion to learn about the many problems of our time and alternatives for our future. At the same time, Seoul Conference provides an opportunity to learn the insights and wisdom of leading scholars and eminent leaders from politics and business. To summarize the 2018 meeting, despite all the problems we have, we are looking for ways to make our belief in the better future a reality. The Korean Conference Committee is also making great efforts to make the whole conference an opportunity for both learning and fun. Korea is renowned for its old tradition and culture as well as its IT technology. As evidenced by the opening and closing ceremonies of the PyeongChang Winter Olympics, Korea is a country where fusion with tradition, culture and cutting-edge technology is uniquely realized. In addition, Korea is famous for its abundance of beautiful tourist attractions. We welcome all those who are ready to learn and enjoy, and all those who want to explore Korea. Please register and join the 2018 Seoul Conference. Not much activity to be reported in this reporting period. Tuesday, 9 January 2018, chapter members attended a Fulbright Forum Talk on “Promoting adolescent health in Nepal: facing the challenge through Medical education,” delivered by Dr. Betsy L. Fine, Fulbright Lecturer on the Medical Sciences. Tuesday, 30 January 2018, chapter members attended a Fulbright Panel Discussion on “Human Trafficking in Nepal, what has changed and what not?” Panelists included Ms Benu Maya Gurung, Ms Rakshya Ojha and Ms Dechen Lama (advocate). Saturday, 3 February 2018, chapter leader Nirendra Dhoj Maske chaired the East West Center/ University of Hawaii at Manoa Alumni Booth at the Education USA Fair held at the Yak and Yeti Hotel from 10:00 am to 4:30 pm. Saturday, 23 February 2018, chapter members attended a US Fulbright Researchers Presentation in Gyaneshwor, Kathmandu, The program was kindly hosted by USEF/Fulbright Director Tom Robertson and US Embassy Public Affairs Officer Tristram Perry. The Rotary Club of Islamabad invited Dr. Arjumand Faisel, President EWCA-Islamabad Chapter, for a presentation on maternal mortality in Pakistan on 9 January 2018. The meeting was held at Marriott Hotel Islamabad from 5.30 to 7 pm. The presentation was considered very informative and useful by the Rotarians. It compared the maternal mortality rate with several other countries and discussed the three delays that results in high maternal mortality. Suggestions were made and discussed that how the Rotary community can help to improve the situation and the attending members agreed to come forward for this cause. Feriyal Amal Aslam lives in Jakarta and Islamabad and is member of both Chapters. During her recent 6-months stay in Islamabad, the Asian Study Group and the Lok Virsa (Folk Heritage Institute) invited her to make a presentation of her dance journey on 02 Feb at the Media Center of Lok Virsa. She presented her story through slides, covering her initial learning stages in Pakistan, followed by her education in Hawaii and then the discovery of new horizons in Indonesia. She also performed in between the presentation to explain finer components of different dances. It was thoroughly enjoyed by the audience. The Asian Study Group of Islamabad in Collaboration of EWCA Islamabad Chapter organized an event “Sight Beyond Sight” at Serena Hotel on 16th March. It was a unique inspiring event of paintings exhibition and discussion with a 44-year-old Dr. Zarina Hasan who lost her vision in both eyes in 2015. In her words when she was breaking apart, she picked up the brush and canvas in Feb 2017 and in just a year’s time created several paintings. She mesmerized the audience during the discussion session about her journey as an artist, which was moderated by Dr. Arjumand Faisel. The East-West Center Hawaii, Alumni Association Karachi chapter arranged a meet-up at Karachi press club for Ms. Susan Kreifels, Media Program Manager East-West Center Hawaii. Many Karachi Alumni attended the meeting with Ms Susan Kriefels who briefed us on the upcoming International Media Conference – IMC 2018, in Singapore. Ms. Kriefels informed us that some seniors at EWCA office have left, including Mr. Shabbir Cheema. Susan also talked about the Center’s future programs. This occasion turned cherish-able with everyone remembering memories of EWC. Susan was presented with an ajrak, a traditional token as an honored guest. Another event this quarter was a photo exhibition sponsored by the Center for Excellence in Journalism to honor two esteemed members of the Karachi Press Club, Athar Kahn and Naeem Sahoutara. The ‘Sights of South Asia’ photo exhibition was held on Monday, February 19, at CEJ IBA city campus 4th floor Aman Tower. Their photographs document their journeys through India and Sri Lanka as part of a collaborative project with the East-West Center Journalist Exchange between India and Pakistan funded by the US Embassy Islamabad. 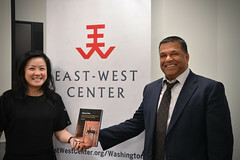 Kamal Siddiqi, Director of Center for Excellence in Journalism and an alumnus of the East- West Center, welcomed the Consul General of Sri Lanka Mr. G.L. Gnanatheva, Susan Kreifels from East West Center, and Krish Das, spokesperson of U.S consulate. Our Karachi Chapter Communication Liaison, Ghazhala Fasih attended the meeting. Journalism students from Center for Excellence in Journalism, and Media also attended the event. The Chapter started the year 2018 by welcoming Scott MacLeod to the EWCA Fellowship lunch on 10 Feb 2018. He briefed us on the latest EWC initiative to increase in regional activities. The focus of this initiative is leadership development, empowering informed effective actions and learning. The EWC will work with people from across the Asia Pacific and in very diverse walks of life and age groups. The Singapore chapter was pleased to meet Scott and to be updated in this area. Quite a number of alumni members turned up to host Scott. Also, photos of the 3 groups of alumni members who came in at different times of the lunch day. On 21 Feb 2018, The Singapore chapter friends met up with Ramnath Chandrasekhar our EWC APLP 2018 participant. Ram is a professional nature photographer, film maker and educator from India on a field study trip to Singapore. We hosted a dinner and a visit to a primary school for him to conduct a workshop for students to learn about environment and conservation. In addition, Ramnath Chandrasekhar was invited to a Primates Talk and to participate in a gardening project in the famed Botanical Gardens in Singapore which is a World Heritage recipient. The photos below represent Ram and his activities as hosted by the Singapore Chapter and friends. On 29 March 2018, the Singapore Chapter congratulated our senior alumnus Basskaran Nair, a 1977 grantee, for the launch of his latest book, Marketing Public Policy : Complexity, Hurts and Minefields at the National University of Singapore. This book fills a much-needed gap in the existing literature on public policy by fusing complexity theories with communication practices, especially where behaviour is a unit of analysis. The book aligns with the behaviourial foundations of policy making and goes further by exploring the what, why and the how to of policy making. The text offers a wonderful resource to aid policy makers, as they anticipate and participate in the policy making process. This event was supported by alumni members past and present, including Basskaran’s son Jon Nathaniel, and grandsons Asher James and Ellery Jude. No activity in the 1st quarter of 2018. This entry was posted in Alumni, EWCA Chapters, Uncategorized and tagged EWCA, EWCA ASDP Chapter, EWCA Bangladesh Chapter, EWCA Brisbane Chapter, EWCA Hong Kong Chapter, EWCA Islamabad Chapter, EWCA Kansai Chapter, EWCA Karachi Chapter, EWCA Laos Chaper, EWCA Nepal Chapter, EWCA Seoul Chapter, EWCA Singapore Chapter, EWCA Vietnam Chapter. Bookmark the permalink.